This exquisite Guatemalan style luxury estate is the largest and most luxurious home in the Las Olas Dominical neighborhood. 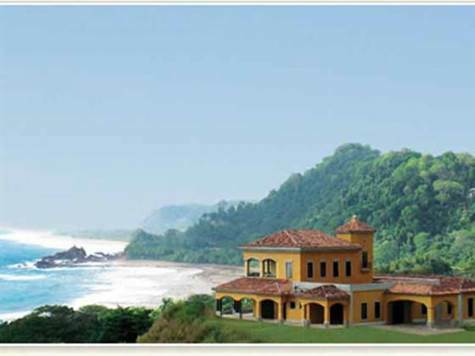 Costa Rica Luxury Real Estate at its pinnacle! Completed in 2005, the estate was 3 years in the planning, constructing, furnishing, and landscaping. The house has over 8500 square feet of living space with 5 bedrooms and 5 baths. Casa Paraiso possesses a view of the Pacific Ocean that has to be experienced to be appreciated. 365 days of pure Pacific sunsets, this is truly a unique property in one of the most exquisite coastal areas of Costa Rica. This finely appointed Dominical Luxury Estate is equipped with a wine cellar, courtyard entrance, movie theater for over 24 people and infinity-edge pool overlooking the Pacific Blue! Its location is world-class from top to bottom. There are just too many special features here to count, so if you are seeking the finest Costa Rica Luxury Real Estate experience.. it does not come any better than this.